CONFIRM YOUR INTUITION. REDUCE YOUR RISK. With its full concentration on the user and user experience, a Morelli Opportunity Analysis makes it possible to develop a specialized offer based on your customers’ needs and wants, and to expeditiously assess its commercial potential. When we understand the problems identified by your users, we are positioned to develop innovation-driven solutions. Morelli uses its tried-and-true methods to conceptualize ideas and test them in short order. 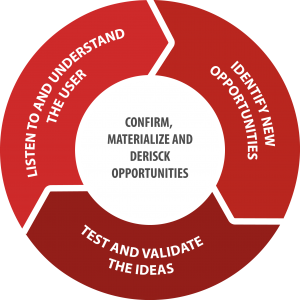 Our Opportunity Analysis process results in maximum competitive value for your offer and reduced risk of error in innovation and new product development. We work with you on a full assessment of your project: its vision, its value proposition, and its desired positioning. Once the team and its efforts are laser-focused, we go out to meet your market and capture satisfaction criteria, motivations, and unarticulated needs. With these data in hand, opportunities are revealed and translated into concepts for market testing. This is how we identify what creates value and benefits for your target clientele, forming the bases for the specifications of the development phase. SOUND GOOD? GET STARTED BY BOOKING YOUR EXPLORATION DAY! NEVER MISS A CHANCE TO INNOVATE! GET GOING WITH YOUR OWN EXPLORATION DAY.